After trying many approaches to treat Lyme and co, I was running out of options. I researched Rife and decided on purchasing Spooky2. It was the best decision I could have made. Spooky2 has saved my life so far. After trying many approaches to treat Lyme and co, I was running out of options. I researched Rife and decided on purchasing Spooky2. It was the best decision I could have made. I wish it had been my first choice when treating Lyme and co. 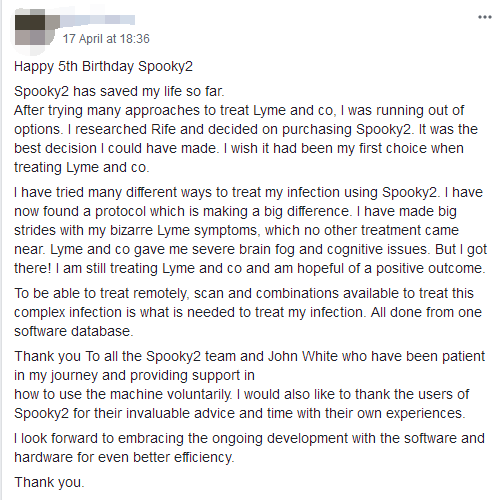 I have tried many different ways to treat my infection using Spooky2. I have now found a protocol which is making a big difference. I have made big strides with my bizarre Lyme symptoms, which no other treatment came near. Lyme and co gave me severe brain fog and cognitive issues. But I got there! I am still treating Lyme and co and am hopeful of a positive outcome. To be able to treat remotely, scan and combinations available to treat this complex infection is what is needed to treat my infection. All done from one software database. Thank you To all the Spooky2 team and John White who have been patient in my journey and providing support in how to use the machine voluntarily. I would also like to thank the users of Spooky2 for their invaluable advice and time with their own experiences. I look forward to embracing the ongoing development with the software and hardware for even better efficiency.